Who will check my email when I die? Episode 04: The Emotional Triggers Episode with Hazel Thornton. That’s the official title, because the first 13 minutes is Kelly Chisholm talking about how conflicting money personalities can affect a relationship. DO YOU HAVE lots of things in lots of different places? Would you would like to create emotional freedom for yourself? Or to organize your life to make things easier for those close to you, in case of your death? Then listen in to today’s guest, Hazel Thornton, founder of Organized For Life, as she talks candidly about the necessary steps you can take to protect your family and yourself for this inevitable eventuality. Hazel is a Personal Organizer and the creator of the Clutter Flow Chart Collection. She’s also a Golden Circle member of the National Association of Professional Organizers, a founding member of Professional Organizers of New Mexico, a certified Personal Photo Organizer and a certified Interior Redesigner and Home Stager. Hazel has a calming approach, which takes any embarrassment or fear out of the process. Listen in and find out how to get your digital records organized, in case of your death. TODAY HAZEL TALKS ABOUT: •Organizing your digital life and digital documents. •The word legacy – what it means to people. •The implications of leaving your affairs in a state of clutter when you die. •The personal story which motivated Hazel to do what she does. • Your Legacy Contact on Facebook. •The implications of dying without a will. •Some of the most important resources to begin with, when organizing your life. •The Legacy Resource Roundup on Hazel‘s website and how it can help you. •What a digital will is and the benefits of having one. •Her Worry Matrix and how it can help you. 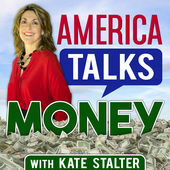 I’m proud of this interview I did with Kate Stalter, on her America Talks Money podcast. She was inspired by a presentation of mine that she attended called “Who Will Check My Email When I Die?”. It’s Episode 04, and it’s called “The Emotional Triggers Episode” because the first 13 minutes feature Kelly Chisholm talking about how conflicting money personalities can affect a relationship. The rest is Kate and me (20 min). EMOTIONAL TRIGGERS are very important when trying to work something out in a relationship, especially around money. Everyone has their own ideas and beliefs about money and this is what Kelly refers to as your Money Personality. It’s always different with everyone, yet there’s no right or wrong here. Due to these different personality types, it’s important for couples to take time to sit down and figure out their Money Personalities and then look at the problems they could be having with that. It’s necessary for couples to get onto the same page about money- and this is where professional financial help can really work. •Organizing your digital life and digital documents. •The word legacy- what it means to people. •The implications of leaving your affairs in a state of clutter when you die. •The personal story which motivated Hazel to do what she does. • Your Legacy Contact on Facebook. •The implications of dying without a will. •Some of the most important resources to begin with, when organizing your life. •The Legacy Resource Roundup on Hazel‘s website and how it can help you. •What a digital will is and the benefits of having one. •Her Worry Matrix and how it can help you.